The AbinitSim group belongs to the Institute of Fundamental Physics at CSIC (Madrid). At present, our activities are being developed within the framework of the National Project "Multiscale Ab-initio Modelling of Quantum Fluids and Molecular Processes at the Nanoscale". Our research is aimed at extending and applying the ab-initio concept developed within the framework of the electronic structure of molecular systems, to include: 1) quantum nuclear effects in weakly-bound systems under confinement, and nuclear quantum delocalization in electronic structure calculations; 2) electronic correlation effects in extended systems including (semiconductor) oxide surfaces and carbon nanostructures (e.g., adsorbate-surface dispersion-dominated interactions and/or including excited states). Specific on-going projects include ab-initio simulations of 1) quantum nuclear motion in doped helium and para-hydrogen clusters and nanodroplets; 2) quantum confinement in carbon nanotubes; 3) the helium droplet-mediated (soft-landing) deposition of metallic nanoparticles on technologically transition metal-oxide and carbon surfaces, and 4) molecular photoreactivity/physisorption on transition metal-oxide and carbon surfaces. Our research has involved the collaboration with European research groups of the cooperative networks CODECS (CMST COST Action CM1002) and MOLIM (CMST COST Action CM1405), and transnational collaborations. 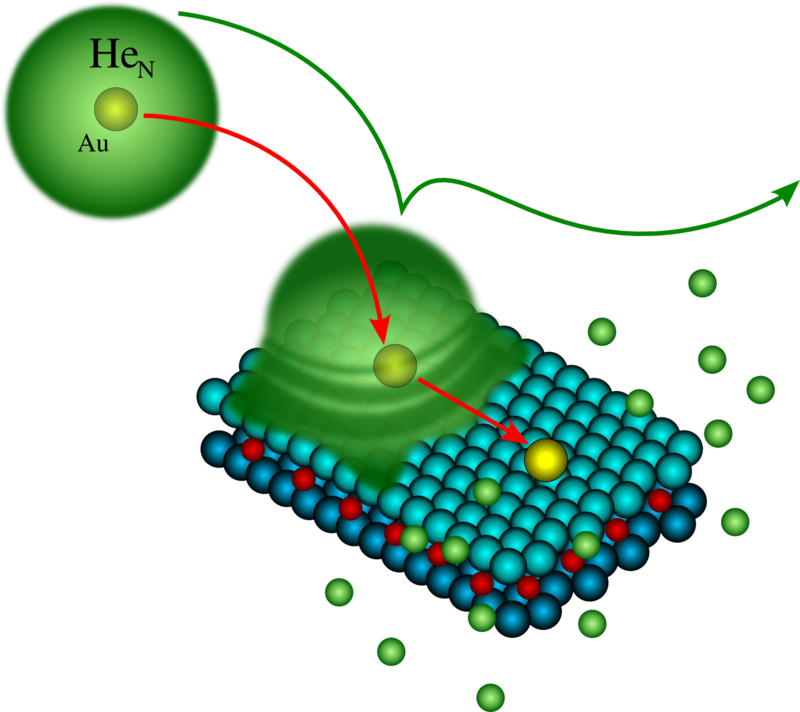 1) Ab-initio simulation of quantum nuclear motion in helium (and para-hydrogen) clusters and nanodroplets. We have extended ab-initio methods to the description of nuclear quantum effects in doped helium (Phys. Chem. Chem. Phys. 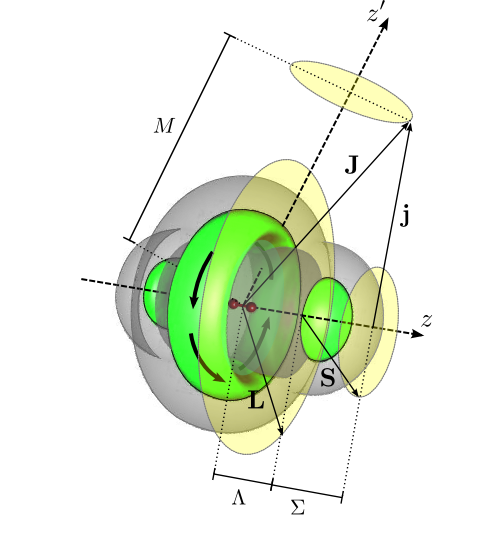 15 (2013) 12) and para-hydrogen (e.g., J. Phys. Chem. Lett. 2 (2011) 2145) clusters. These methods have been applied to the spectroscopy of molecules solvated by helium (e.g., Chem. Phys. Lett. 555 (2013) 12). Our aim is to complement existing techniques by accounting for (bosonic and/or fermionic) nuclear spin statistical effects, and by describing the excited states of quantum solvents with a similar accuracy to that of the ground state, and to study nuclear delocalization effects beyond the Born-Oppenheimer approximation (e.g., J. Chem. Phys. 138 (2013) 184113). 2) Ab-initio simulation of quantum confinement in carbon nanotubes. Very recently, within the framework of a collaboration with Andreas W. Hauser (Graz University of Technology) and Alexander O. Mitrushchenkov (Université Paris-Est), we are dedicating much effort to the description of quantum nuclear motion of atomic and molecular clusters in carbon nanotubes (see. e.g., J. Phys. Chem. C 121 (2017) 3807, and Phys. Chem. Chem. Phys (2017) DOI: 10.1039/C7CP05869A). Our most recent contribution shows ab-initio evidence for hexagonal close-packing of molecular deuterium clusters in carbon nanotubes (Phys. Chem. Chem. Phys. (2017) DOI: 10.1039/C7CP05869A). 3) Ab-initio simulation of the helium droplet-mediated (soft-landing) of metallic nanoparticles on technologically relevant surfaces. The photocatalytic and/or catalytic properties of surfaces can be improved through the controlled deposition of metallic nanoparticles. An innovative experimental technique uses helium nanodroplets as the carriers of the embedded nano-particles to the target surface in soft-landing conditions. The ab-initio simulation of this process requires the calculation of realistic potentials accounting for the dispersion-dominated interaction of the quantum solvent with the surface (e.g., J. Chem. Phys. Communications 141 (2014) 151102) as well as the inclusion of nuclear quantum effects into the dynamics (J. Chem. Phys. 136 (2012) 124703/1-14). Very recently, the first theoretical evidence of atomic soft-landing has been reported within the framework of our collaboration with the Universities of Barcelona, Paris-Est, and Stuttgart (J. Chem. Phys. Communications 142 (2015) 131101). A special ab-initio-based scheme has been recently proposed to calculate the necessary van der Waals-dominated adsorbate-surface interactions (e.g., J. Chem. Phys. 143 (2015) 102804). Within the framework of a collaboration with Andrey Vilesov (University of Southern California), our latest progresses include large-scale ab-initio simulations of the helium droplet-mediated deposition of nanoscale silver clusters on carbon surfaces (see., e.g.,J. Phys. Chem. C 121 (2017) 22248). 4) Ab-initio simulation of molecular photoreactivity/physisorption on transition metal-oxide/carbon surfaces. First-principle studies of excited states on extended (semiconductor) metal oxides are required for a better understanding of their photocatalytic properties. In order to achieve this goal, it is necessary to calculate the properties of the molecule-surface complex in both the ground and the excited electronic states (J. Chem. Phys. 118 (2003) 5098) as well as their couplings with the substrate elementary excitations. Through the application of ab-initio techniques for molecular systems, it is possible to apply a rich tool box of different methods to accurately treat excited states. However, these methods can not deal with the infinite (periodic) environment. In order to include it, we have worked out an embedding technique (J. Phys. Chem. C 115 (2011) 17540), having been successfully applied to bulk titanium dioxide. We are also interested on accurate descriptions of molecular physisorption on transition metal-oxide and carbon surfaces. For example, we have studied the physisorption of noble gases as molecular probes to monitor photocatalytic activity in titanium dioxide surfaces (see, e.g., J. Phys. Chem. C 120 (2016) 18126). A remarkable agreement with experimental measurements of nuclear bound-state energies has been achieved for molecular hydrogen adsorbed on graphene.